Note: A version of this post appeared on this blog on September 11, 2013. I was torn about how best to approach September 11 in classrooms. On the one hand, this day, now known as Patriot Day, is an important one to remember. It is seared into our national memories and has become part of our psyche, a painful, painful moment that brought us to our knees and in some heartbreaking way united us then and unites us still. On the other, many children we teach were not yet born when this day happened. Why dredge up an uncomfortable past, one that these children don’t remember, and that to most adults around them, is still raw? Further, I wasn’t sure what I believed was an appropriate way to address the day. Somehow talking about the buildings coming down and the aftermath, or even rehashing my own experience of that day in a classroom in New York City didn’t feel quite right. And then I thought: This is one reason I believe so much in history education. To strive for a better future than the past. Hence my middle of the night quest to find an appropriate way to address September 11, and this middle of the night post. Teaching tolerance and accepting differences, no matter which group of people is considered the “other”. Following are some lesson ideas that address these themes. Momma’s first day on the job, she comes home late, trudging up the stairs as if they laid that heavy stone right on her shoulders. She is grey and ashes, from her headscarf to her boots. Even her bouncy beaded earrings have gone dull as dirt. I think about the hands that worked on every stone until it was exactly right, knowing that it had to hold up all the rest. Knowing that it had to last a long, long time. Then I think of all the people who will come together in Big John. Not for an art to look at. For an art to be. What a beautiful way to celebrate construction, not destruction. There are many buildings across our country, in every community, that were built with love and care and that serve to bring people together. This book honors those buildings and the men and women who built them. 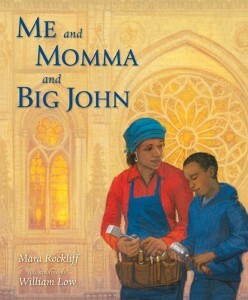 The read aloud could follow with a discussion of the important buildings in children’s communities and the ways in which those buildings are unique and enhance the lives of the people who use them. Teaching tolerance and accepting differences with a read aloud. There are many, many lessons that aim to teach tolerance. Of course, our society continues to be rife with racial tension. And, of course, racial tension played a role in the 9/11 tragedy. Racial intolerance may feel too huge an issue to address in one lesson, with one group of children. But by aiming to teach tolerance and acceptance, and by discussing small ways in which children can take a stand against injustice, we are planting seeds for the next generation to be better. More tolerant, more accepting, and less likely to cultivate the beliefs that led to an event such as 9/11. It’s easy to think, someone else was responsible for September 11. It’s not us who should learn tolerance. But tolerance starts with each of us. The more we contribute to a collective belief that differences are to be accepted, not stamped out, the more we can create a world in which living together peacefully is possible. 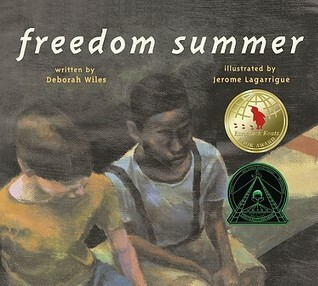 Freedom Summer by Deborah Wiles is about a young white boy, Joe, growing up in the American South in the 1960s. His best friend is John Henry, an African American boy. Joe and John Henry ignore the racial tension that surrounds them until a mandate that leads to the filling in of a local pool makes this ignorance no longer possible. John Henry finally gives voice to his hurt and anger, and Joe must decide whether to take a stand for his friend. This book shows that tolerance starts with each person, and each of us can work toward a more accepting society, a world in which events like 9/11 are fewer and farther between, just by taking one action. I wish for all of you a safe, reflective September 11, and I wish for all of our children a future where a day such as that one never happens again. Note: These ideas were adapted from lessons that can be found here and here. #NFBookClub: Don’t forget to post your questions! I’m sure you are deep into our read for Monday night, 8pm EST. Don’t forget to post your questions here. There is a section for questions about the book’s content, and a section for questions about our own nonfiction reading/book club process. And if you have time, check back to see what questions others posted. Remember, we will be chatting with a different hashtag: #NFBookClub. It’s likely happened to you. You showed up to a book club, with your book read and your notes prepared, lofty ideas in your back pocket. (“The hammer clearly symbolizes her frustration with her mother.”) And then one of your club members shows up and says, “I didn’t really have time to read the book, you guys go ahead and talk about it without me,” and then proceeds to hijack the conversation with celebrity gossip and other non-sequiturs. Or, perhaps, you have been that person. I know I have. But that was before. I’ve since learned that in order for any book club to be successful, there are areas of practice to which club members must dedicate time and energy. These areas are preparation, connection, and reflection. Club members must prepare. They must not only read the text, they must digest it, analyze it, distill it. Preferably they record some of their best thinking to have at the ready. Club members must connect with one another. During the discussion (and at times beforehand), club members must listen to each other, consider each other’s ideas, and look for patterns and points of agreement or dissension. Throughout most of my teaching career, I taught my students to consider the former two areas of practice, preparation and connection. But after trying the work in my own nonfiction book club, I realized that reflection is crucial as well. Club members must reflect. They must think about which strategies work for them as readers, and which don’t. They must think about what is difficult as they try to distill the information in a text. They must think about ways that they are getting stronger at talk and ways that they still could improve. After our chat, I had a few realizations about each area of practice. It helps to have a shared space where club members can post ideas and questions prior to the discussion. These posted ideas form the agenda for the club, and allow club members to preview each other’s thinking. Club members can see places where ideas intersect and can come prepared to talk further about these intersections. In short, posting thinking beforehand can lead to much deeper thinking and talking in the actual discussion. I believe it was Jenn Hayhurst who posted the question before our chat: How does scarcity influence school culture? We could have discussed this question alone for the entire hour. When considering which ideas to bring to a club, one could think about ideas that have strong personal relevance and ones perhaps with an emotional charge. We can think, what ideas or questions will my club really care about? If we can imagine a discussion topic taking up an hour, chances are it’s a great topic to bring up. As we read, some of us came up with systems to track and make sense of what we were reading. I tried using the colored highlights in the Kindle app to categorize information. I used pink for themes and big ideas, blue for supporting evidence, yellow for parts that resonated for me personally. Allison Jackson adopted a system from Content-Area Reading by Harvey “Smokey” Daniels and Nancy Steineke. The system channels readers to use symbols to denote certain reactions to the text and kinds of thinking, like discovering something new or when coming up with a prediction. Simply saying “I agree,” or “yes” and naming a person and the point with which we agree does wonders to organize a conversation and anchor the new point one is making. One thing that is interesting about Twitter as a chat avenue is that it is possible to hold side conversations without interrupting the flow of the main discussion, something that is harder to do in person. Students may find that certain discussion points really spark their interest, and may wish to delve into them further, perhaps just with one or two club members. I’m considering ways this could be done in live discussions. Maybe time could be allotted after a formal discussion for this purpose? Allison Jackson was saying afterwards that she appreciated the slower pace of the chat. Certainly, when engaged in Twitter chats with scores of participants, it can be difficult to get a word in edgewise. And it is hardly possible to absorb all of the ideas being bandied about. Our chat had fewer participants, but it also had fewer questions. We could take our time, ruminate, consider. Something we probably don’t do often enough. One thing I realized after our chat is I could so much more to guide students in book clubs to reflect on their talks. Getting students to consider what went well and what they could do better next time as club member would be heady meta-cognitive work with a huge payoff. Of course, what I am capturing here is just a small cross-section of the brilliance that emerged on July 7. It never ceases to amaze me how eloquent people can be in 140 characters or less. I had high hopes that Storify would work seamlessly for me to compile and publish the chat for all to see. Alas, there is a glitch that prevents me from compiling the entire chat (only 20 tweets are showing up in the Storify timeline, if anyone knows a good workaround, please let me know!). I hope that this post captures just a few of the takeaways for those who weren’t able to attend. And for those who were, please feel free to add to this post in the comment section. I would love to hear about your personal insights and realizations. I will continue to build on this list as we continue to discuss Daring Greatly, by Brené Brown. If you are coming across this post and would like to join, we are reading chapters 3, 4, and 5 for July 21st, 2014, chat to be held at 8pm EST. Please feel free to share your thinking in advance on our group document. One final note, we are going to try a different, shorter hashtag: Please use #NFBookClub on the 21st to join. Looking forward to seeing you then. Happy reading! 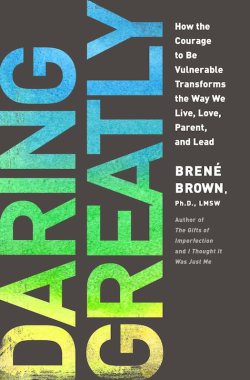 Deep into chapter two of Daring Greatly by Brené Brown, part of assignment one for our summer nonfiction book club, I found myself thinking about how our first book discussion might go. I had been thinking that the best way to begin might be with very little advance planning, just to have everyone show up and contribute organically. But then, I thought about what some club members said about preferring to think about questions in advance. I didn’t want to post a list of questions or discussion topics myself, since I felt that might be too prescriptive. So I considered what would be the middle ground. Many teachers who are guiding students book clubs ask students to choose their best question or idea and write it on a post-it, and then put it in the center of the table for the club to discuss. The post-its form the agenda for the club, helping to keep the discussion on track and focused. A way to help students focus their preparation and begin thinking about each other’s ideas right at the start is to create a space, digital or otherwise, where they can post their chosen ideas beforehand for their group members to consider. This way, students can see connections, consider implications, think through possible responses, and find evidence for each other’s ideas, possibly leading to greater depth in the discussion. If you have time before our book club discussion tonight, please add an idea or a question to this shared document. You might consider coming back to the document before our chat to glance over others’ ideas in preparation for our discussion. What is posted in the document can form the agenda for our discussion. Of course, posting in the document is completely optional, and we will have more time to contribute there for the next reading assignment. Thank you all for joining on Monday night. I am learning so much already! Many of our club members have experience with book clubs in general, and specifically with adult book clubs using Twitter as a discussion avenue. One thing that makes our book club slightly different is that the content of our book is not the focus of our club, nor will it be the main focus of our discussions. Instead, we will study how we read and write to prepare for a nonfiction book club discussion, and what we do during discussions to grow ideas. We will read the introduction, and chapters 1 & 2 for Monday, July 7. We will meet on Twitter at 8pm EST to discuss. Our next meetings will be July 21 and August 4. Our goal is to read chapters 3-5 for July 21 and 6-7 + the conclusion for August 4. We can adjust this plan if needed. We discussed possible lenses we can use to study our work. We can study ways that writing leads to stronger talk. This might include studying the kind of writing we do, or what we choose to write about, or how often we write. We can study ways we search for ideas, not just facts. We can study how we make personal connections to information. We can notice what we do when we step back from the content of the book to study the author’s craft. There is so much more that we can notice and name as we read. Of course, new ideas about what we can study will abound once we are doing the work. Please feel free to leave comments adding to this list – what other lenses are you using to study your work? How are you getting ready to talk about the text? Q5: Let’s talk lenses for our reading. What are some of your goals as a reader of NF for the #NonfictionBookClub? Q6: What are some of your goals as a teacher of NF Reading for the #NonfictionBookClub? I am so looking forward to chatting with everyone on Monday and officially kicking off our summer reading. See you soon! We haven’t yet officially begun our nonfiction book club and already I’m learning valuable lessons I plan to channel into my teaching. Lesson one: It’s very likely that not every group member will get to read his or her first choice. There will be disappointment. And in disappointment, there is often opportunity for learning. How will our students handle the disappointment that comes with not being able to read what they’d hoped with their club? How will we? We have choices. We could mope, or refuse to participate, or approach the club with a closed heart. Or, we could embrace the club’s choice, seeing the alternate pick as a chance to broaden our own horizons and discover something we might not have about the world, or ourselves. As is often the case, lessons learned while learning to be a better reader become lessons for life. If we can help kids become more tolerant when things don’t go their way in a book club, perhaps we can teach them to be more tolerant when things don’t go their way in general. We are reading Daring Greatly by Brene Brown. I hope all of you who were hoping for a different book not only embrace this choice, but also read the book you most wanted to read, perhaps using this second read as an opportunity to try out some of the moves you pick up while reading alongside others in our club. That is, after all, what we’d want our students to do. I so look forward to reading and chatting with you. You voted to begin toward the end of June. That will give us all time to get the book and to start thinking about our goals and plans as readers. You also voted that Mondays at 8pm EST would be the best time to chat. Why don’t we plan to join on Twitter Monday, June 23 at 8pm EST to get our book club started. No need to read before then – we can discuss reading assignments and goals at our meeting. Nonfiction Book Club: It’s a tie! Future book club members, we have an exciting problem on our hands. Our survey revealed not only that we have a good-sized group planning to join us this summer, but we have a passionate group of readers with a wide variety of reading interests. So, let’s take another vote. Please help us choose the winner by Thursday, May 29 at 11:59pm EST. I’ll reveal the results on Friday the 30th. I’m looking forward to the big reveal! Summer Nonfiction Book Club: What would you like to read? We’ve had great response to the summer nonfiction book club idea proposed last week in the below post. I’ve compiled everyone’s suggestions and created a survey. 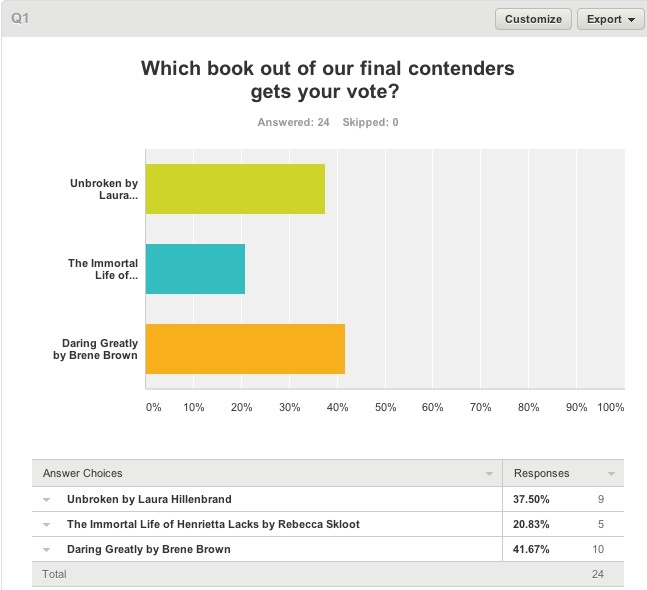 I believe the survey will help us to be a bit more quantitative (and, I hope, fair) about our book selection. Your responses will also help me to set times for our virtual meet-ups. If you are planning on joining the book club, please weigh in. I’m looking forward to finding out what we choose! I will leave the survey live for a week, and then I will reveal our selection. Click here to access the survey. Thanks very much for participating.